Paw Patrol. I think it’s got to be the most popular programme for kids at the moment, my two and all their friends are obsessed. But have you seen the price of the toys? Ouch! We love easy activities for toddlers and this simple idea means you can make the most of the cheaper toys without having to spend out on all the big pricey extras. Is it still a big thing to play with? 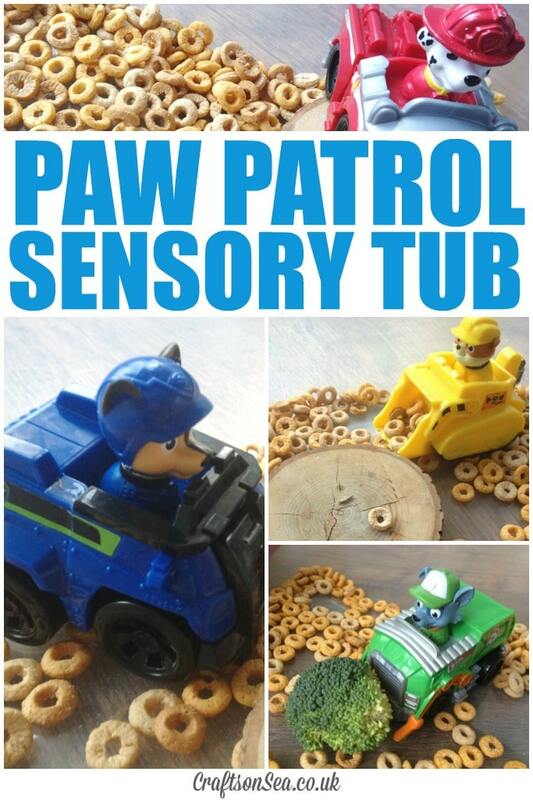 Heck yes, but this Paw Patrol sensory tub will cost you pennies and even better if they tire of it you can happily throw it away guilt free, saving a bit of room in your toybox too! My daughter has been ill this week so I wanted an easy activity that wouldn’t be too stressful for either of us. 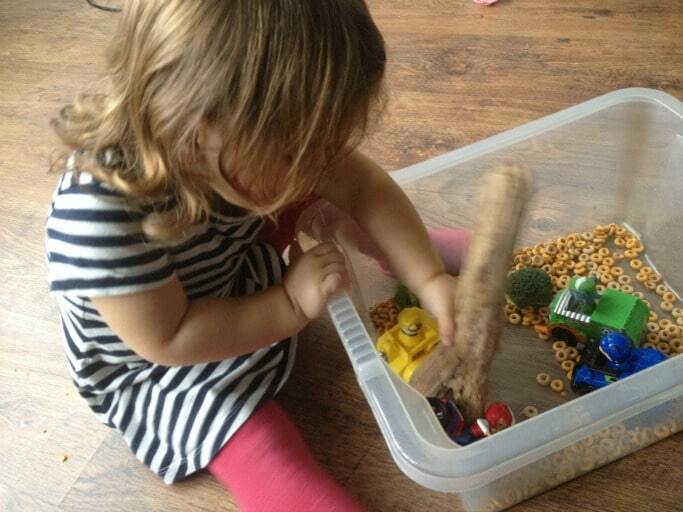 When we first played with our Paw Patrol toys in a sensory bin we used dyed pasta but as one of her favourite things to do was use the scoop on the front of her Rubble toy to move the pasta I wanted something smaller that would fit better. The Cheerios were perfect for this as, unlike rice, if you do end up with a few on the floor they’re not too awful to clear up. 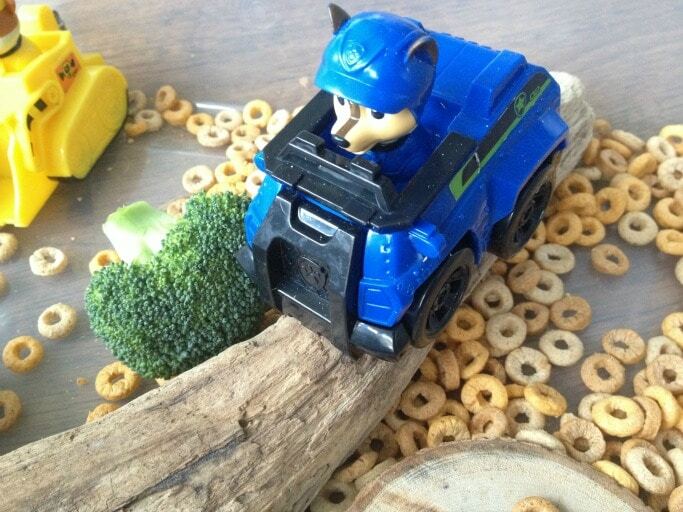 The broccoli was something I’d seen in a tuff spot at a local Children’s Centre where they used it as little trees. Using this along with the wood meant that we could do a bit of small world play with the pups needing to sort out some removal issues in the woods. The pups were also very keen on driving round the edge of the tub, they are obviously little daredevils! It must have worked because I don’t seem to have managed to get a single shot of my daughter that isn’t a bit blurred, she was having way too much fun! 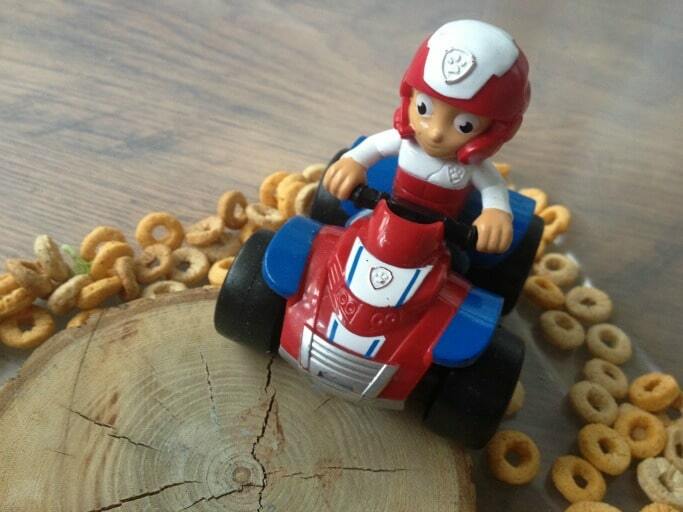 Want more Paw Patrol Activities? My lovely friend Anna over at In The Playroom has a fabulous free Paw Patrol Activity Pack with colouring sheets and a spot the difference game. Go grab it! Sometimes simple is best. I love that the kids really loved it.